Nepal has a typical monsoonal, two-season year. The dry season runs from October to May and there's the wet (monsoon) season from June to September. Autumn (September to November) and spring (March to May) bring almost perfect weather and are definitely the best times to come to Nepal. October to November, the start of the dry season, is in many ways the absolute best time. With the monsoon only recently finished, the countryside is green and lush, the air is sparkling clean and the Himalayan views are near perfect. Furthermore, the weather is still balmy. There are some important and colourful festivals to enjoy, though the Dasain festival in October can be disruptive if you are on a tight schedule. For obvious reasons this is also the high tourist season but in recent years, due to the political problems, even Nepal's 'high season' has been pretty quiet. In December and January the climate and visibility are still good, though it can get very cold at high altitudes. Heading for the Everest Base Camp at this time of year can be a real feat of endurance and the Annapurna Circuit is often closed by snow on the Thorung La. Down in Kathmandu, the cheaper hotels - where there is no heating - are chilly in the mornings and evenings. Tourists start to leave Kathmandu in December like flocks of migratory birds, headed for the warmer climes of India or Thailand. October to February are considered the best times to visit the Terai and Royal Chitwan National Park. February to April, the tail end of the dry season, is the second-best time to visit. The weather gets warmer so high-altitude treks are not as arduous. Visibility is not as good as earlier in the dry season, but Nepal's wonderful rhododendrons and other flowers are in Technicolor bloom. May and early June are not the best times to visit as it is extremely hot and dusty, with temperatures often above 30°C, and the coming monsoon seems to hang over you like a threat. 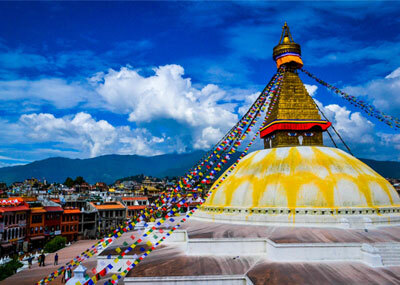 Mid-June to September, when the monsoon finally arrives, is the least popular time to visit Nepal. Although it doesn't rain all day it usually rains every day, and the trails and roads are muddy and plagued by leeches; the Himalaya disappear behind rain clouds; most rivers are too high to raft; and landslides often hold up transport. The latter part of the monsoon (August and September) is a time of festivals, which will certainly enliven a visit to Kathmandu, and this is also the best time to visit neighbouring Tibet. Because of its lower altitude, Pokhara is warmer and more pleasant than Kathmandu during winter, but hotter before the monsoon and wetter during it.